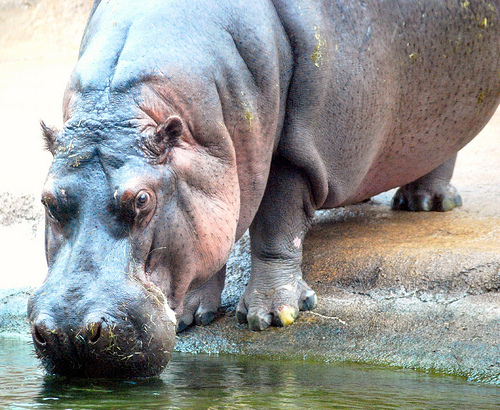 I woke up this morning feeling like a hippo. With great trepidation, I approached the scale … only to find that I’d stayed steady since yesterday. So, all in all, not bad. Even if I stay steady tomorrow, five pounds in a week is pretty crazy for me, and I’m still waiting to see what happens when Aunt Flo takes her voodoo off of me. When I was in my 20s, it was pretty predictable — I’d get my period and drop five to seven pounds that day. Now, I spend a day cramping and blowing up like a water balloon, and then I lose a few pounds after a day or two. I will, of course, keep you posted with much more information than you ever asked for or needed. How are you all doing today? Anyone out there been through the hippo stage of her cycle on this diet? Yes. Right now. I gained 2lbs in two days and started weeping. I will let you know in 3 more days how it went. I start week 3 on Monday so I hope to start loosing again. Hang in there. 5lbs a week is HUGE. Oh, I feel you! Don’t worry, it’s just stupid Aunt Flo, being stupid. And a few people said it’s not uncommon to gain or plateau for a bit in week two. It sounds like you got hit with both at once! Everything will be better in a few days. Same thing here Jennie…..Auntie showed up 4 days early too which is really weird but I didn’t end up gaining anything. Didn’t loose a blessed thing either, but I didn’t gain. My plan is to stay off the scale until Monday morning and see what happens. On a lighter note….has anyone tried the Chicken Curry recipe in the book? Oh my goddess……..it is fantastic and so easy to make. I haven’t, but I love chicken curry. I’ll check it out! Thank you. I too got my lady friend….maybe where the cake icing craving came from 🙂 And I feel like a bloated hippo as well but haven’t gained anything and I am down 3 lbs so far. Which was a huge surprise since I’m doing the diet more for a thyroid problem than weight loss. Everyone should make the coconut curry chicken recipe it is super easy and really really good. My husband is actually eating it again now! I’m making that tomorrow night! I made the avocado chili tonight — sort of. There’s a whole story there involving my lack of domestic skills. It was delicious anyway. Also, how are we all in sync with each other? Is it possible to match cycles over the internet? Can we blame the moon? What gives? btw. I only had sparkling water when i was out last night. However, I ate around 9.30pm, and went to bed around 4am…no way I could have had food at 1.30am. I just had sparkling water at a bar and ate nuts and seeds out of a baggie from my purse. My husband thought it was hilarious, but then he ate a bunch of the crash stash himself. Seeds, popcorn — it really doesn’t matter when it comes to bar munchies. Thank you for the advice re: the scale. I need to let it go for a bit. Hippo here too…freakin Aunt Flo. I know I should ditch the scale and just weigh in once a week but its sooo hard. I’m too curious to know if I’ve lost more overnight. Its like these beautiful little fat munching creatures pay me a visit while I sleep and keep taking a pound with them lol.